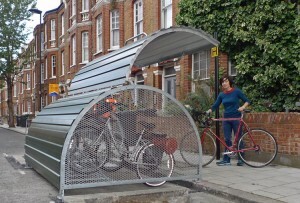 Cycle hangars are starting appear all over London. The Bikehangar is an award-winning popular design for outdoor sites offering a safe and effective way to protect bikes from tough weather conditions and theft where outdoor storage space is limited. They are multiplying quickly in London’s cycle friendly boroughs. 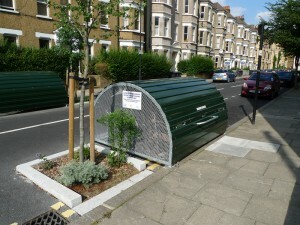 The Bikehangar can securely store up to six bicycles, occupying only half of a parking space.